Is there anything more downright exciting than bringing a new dog home for the first time? We think not! However, it’s important to make sure your place is prepped and ready for the newest family member – particularly when it comes to your backyard. Dogs need plenty of space to run and explore, no matter what size or breed. They’re curious creatures who will follow their nose where ever they go (including over the fence). To keep them happy and safe some adjustments to your materials, fencing, design or landscape may be required. Preparing your yard for a new pooch is not a difficult task, but there are many little bits and pieces that can slip the mind of dog owners. If this is your first furry friend, it’s worth creating a checklist for your backyard and ticking it off. We recommend starting this before they arrive home. Otherwise, you may have a runaway pooch on your hands! Here are our tips for preparing your yard for a dog, so you can enjoy the experience from day one. Fence height: Ensure your fence height is taller than your dog’s maximum jump. You can test this by holding a treat up high to see how high they can go. Fence digging: It’s important to stop your dog creating an escape tunnel. Fences should be installed up to a metre underground to prevent this. Fence view: The more your dog can see, the more they are likely to chase an animal or explore over the fence. Fence materials: Think about footholds for climbing and materials that chew. Good options are wooden fences, modular or aluminium slat fencing. In Australia the summers are hot and the winters can be blustery and cold. Even if you have a dog flap or entrance to the house, it’s a good idea to install a dog house too. This will provide valuable shelter from the elements and a private area for your dog to call their own. Place it under a large tree or outdoor pergola for shelter. Be sure to include a large dog bowl for a water supply they can always access. We don’t have to tell you how much dogs love to dig. The last thing you want, however, is for it to happen in your previous garden beds. Dogs enjoy digging for fun, to bury bones, and to create a nice spot to sit under the sun. You shouldn’t try to stop them digging entirely, but it is possible to prevent unwanted damage (and stop them escaping). From the first day, encourage them to dig inside a particular area. You can prepare it with materials like sand and mulch for easy digging. This will require a bit of training but it’s well worth the effort later. Let’s face it, when you have guests around or need some R&R, the dog just isn’t invited. For this reason, it’s a smart idea to segment out your alfresco areas such as outdoor pavilions and BBQ spaces before they take control. This is best done with purpose-built fences or decorative screens. It’s great for safety, allows your guests to eat and drink in peace when needed, and gives your pooch a designated play area. If you have a pool, it is strongly suggested that you install pool fencing. There are a large number of dog drownings each year due to pools. Always choose a type with a self-closing gate so you can always be sure the area is secure. When it comes to plants, there are some varieties that can cause sickness in dogs. This can change from breed to breed so it’s a good idea to do your research before you bring them home. This also includes chemicals such as insect treatments and weed killers. Common plants to look out for include hyacinth, lilies, daffodils, tulips, azaleas and rhubarb leaves. When you have pets running around its recommended to only use treatments with all-natural ingredients. Before using anything new, check it twice for toxic contents just in case. If you follow these tips you will be well on your way to a dog-friendly yard. 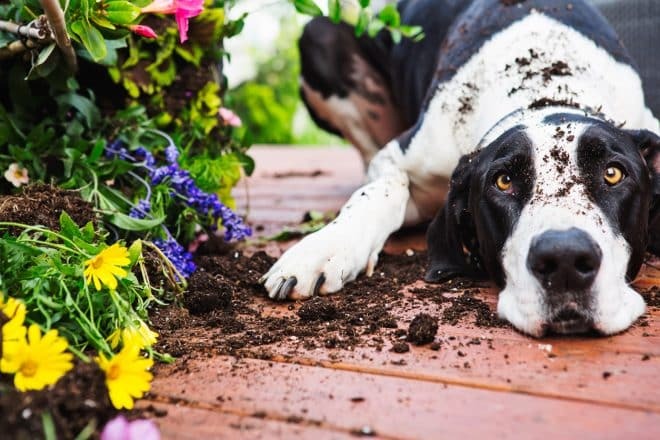 We also recommend training your dog early on to top them finding new ways to create garden chaos. Keep them monitored in the first few months and correct any unwanted behaviour. All that’s left is to enjoy their company! For more help creating the perfect yard for your new dog, call the experts at Everlast today.